In this presentation, we will give an overview of the ETF market and highlight some of the advantages and disadvantages of ETFs. The case for passive investing will be discussed. We will then look at alternative indexing strategies and the methodology behind equal weighting, fundamental weighting and dividend focused funds. We will talk about how to measure risk and look at the risk in various asset classes such as stocks and bonds. 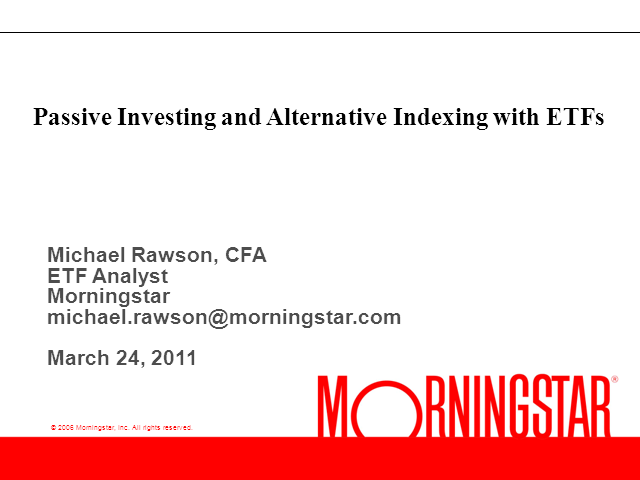 We will then highlight the risk and exposures in the various alternative indexing strategies.